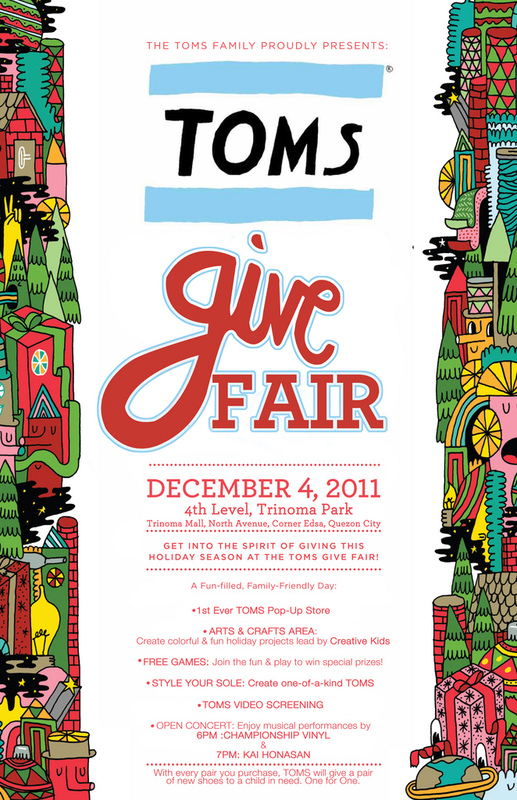 Let's all get together for the TOMS GIVE FAIR on December 4, 2011 (Sunday) at 10am-4pm at the Trinoma Park, 4th Level, Trinoma Mall in Quezon City. Do some Holiday shopping at the first-ever TOMS Pop-Store in the country and, treat yourself to all the wonderful activities TOMS has lined up for you to enjoy a fun-filled day for the whole family and barkada. It's their way of saying thank you and getting everyone into the Holiday Giving Spirit.